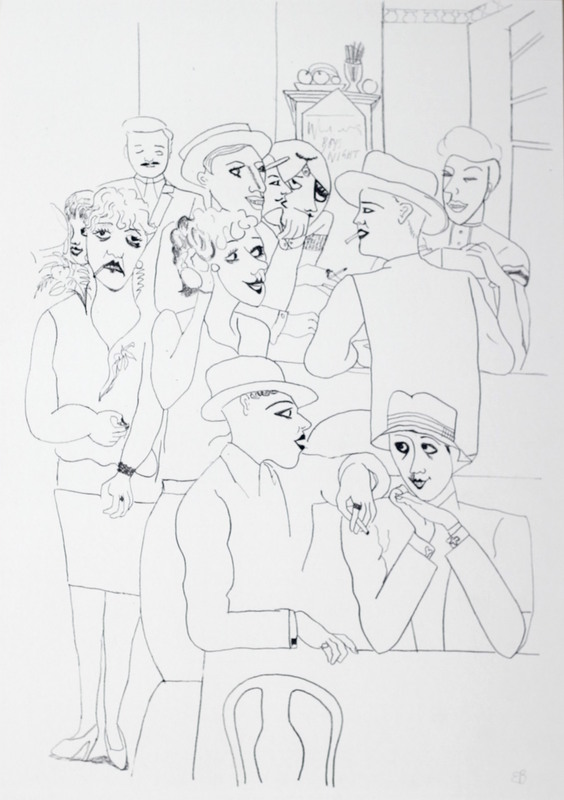 Edward Burra’s lithograph, ‘Figures in a Bar’ (right), was produced in 1931. A few years earlier, in April 1929, Burra’s first solo exhibition had been held at the Leicester Galleries and in 1930 he had shown work with the London Group and exhibited a series of woodblock prints at the Redfern Gallery. He was beginning to establish himself as an artist, yet still experimenting with both media and subject. A key influence in Burra’s early career was Paul Nash whom he had met in 1925. Nash introduced Burra to printmaking – notably wood engraving – and to the ideas of Surrealism. Though never a fully signed up member of the British Surrealists, there is a strong surrealist vein running through Burra’s work; but it is born from a fascination with the real, exaggerated and caricatured, rather than any deep interest in the subconscious. In ‘Photography and Modern Art’ (in The Listener, 1932) Nash also describes the influence that photography had on Burra’s work: “I would suggest that Burra’s extraordinary fantasies, perhaps the most original in imagination of any contemporary English artist, owe something to his keen appreciation of the aesthetic of modern photography.” This appreciation was hardly surprising given that one of Burra’s closest art school friends, Barbara Ker-Seymer, having learnt the art from society photographer Olivia Wyndham, had just established her own studio in 1931. 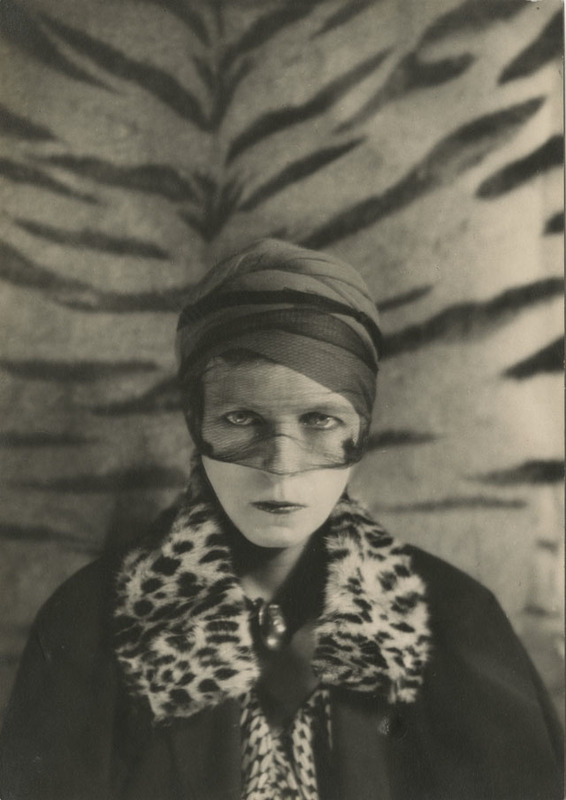 She took striking portraits of figures such as Nancy Cunard and Julia Strachey – and a snapshot of Burra in Toulon, 1931, above left – as well as assignments for Harper’s Bazaar. Other reviews of Burra’s 1929 show judged his work as part of a long satirical tradition exemplified by Hogarth and Cruikshank, the Vogue critic remarking that “this young artist uses the artistic idiom of modern Paris to record Hogarthian observation and satire” (Vogue, April 17, 1929). 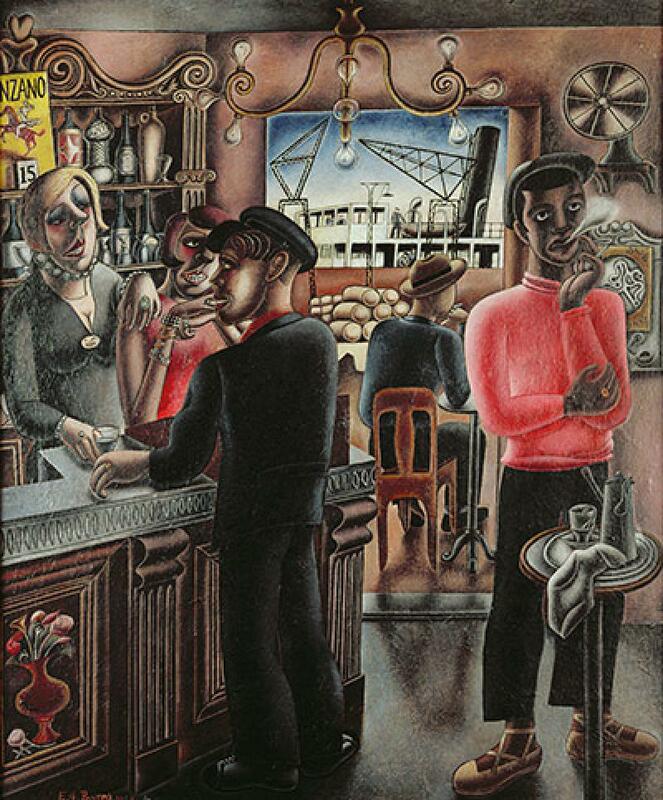 ‘Figures in a Bar’ is a classic example of Burra’s exaggerated social types, in a style permeated with bawdy humour and witty detail. Yet it is so definitively placed in the contemporary world of the late twenties and early thirties that any comparison to Hogarth is based on generic qualities only. 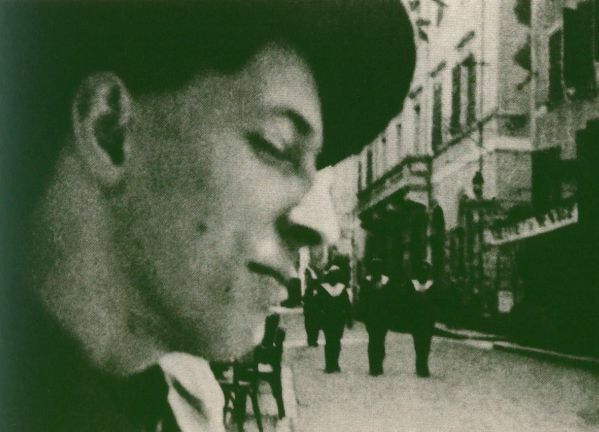 Burra’s satire is indisputably modernist in its (sexual) ambiguities, unexplained symbolism and doubtful narrative, and in its rejection of any moral judgement (‘Dockside Cafe Marseilles, 1929, above right). How about coming up to London & spending a week with your old pals at no 19? Sophie is in London, & Marty is the photographer now, & takes still lives all day, so I can’t go near the camera. I took some lovely congo portraits of Mrs C Lambert, who is furious, Constant of course is delighted. 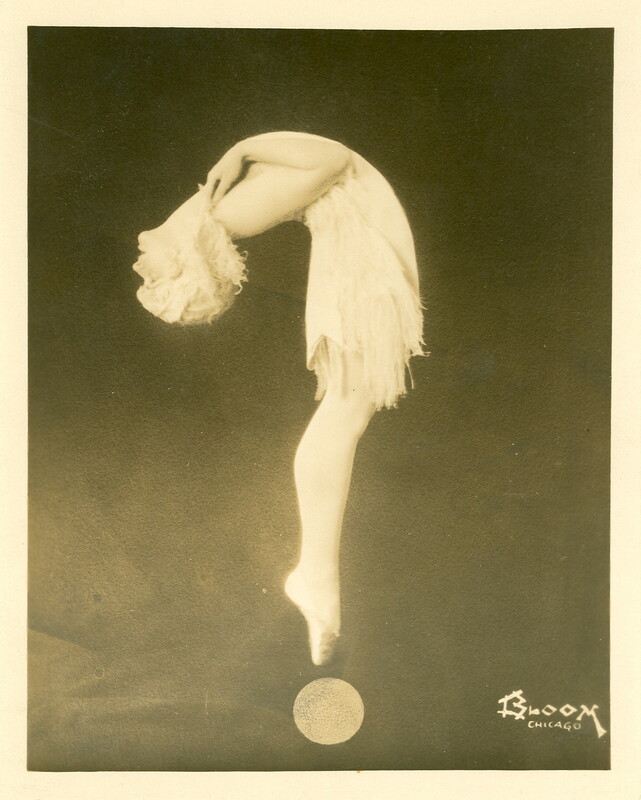 Harriet Hoctor [ballerina and actor, above left] is glorious rehearsing the girls in black mirror velvet pyjamas and her hair bundled into a large & soiled pink hair ribbon … she is always tottering about the stage in this position [sketch of figure bent over backwards en pointe], whatever is being rehearsed in the front of the stage, this strange vision is to be seen staggering about in the background quite by itself, its really quite frightening, with waving arms, the girls are frightful, & the chorus of male fairies is led by George Goodenough … Have you heard Adelaide Hall singing “Minnie the Moocher” on Brunswick? You will adore it, its absolutely marvellous. 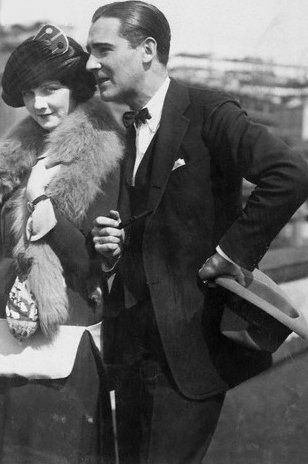 Peter Spencer is back from making a film with Rex Ingram [director of the silent screen, right with Alice Terry] & full of such revelations. (1) Alice Terry is as fat as a pig & can hardly waddle, but is lovely. (2) Ivan Petrovitch is so fat that they have to put chests of drawers etc in front of him to hide as much as poss for close ups. (3) Ramon Novarro was so spotty when he was discovered for Prisoner of Zenda, that they had to take all the long shots first whilst he was receiving treatments from the skin specialist, & he was cured by the time they were ready for the close ups! (4) Rudolf Valentino was completely blind in one eye, also had a wall eyelid, which is why he always drooped his lids, & eventually brought his entire success!! I have a lovely pamphlet from Nancy Cunard called “Black Man & White Ladyship” privately printed in Toulon, such a scandal has never been read [Nancy Cunard photographed by Barbara Ker-Seymer, left]. So this was Burra’s world when he produced ‘Figures in a Bar’ for the Curwen Press. The Curwen Press was established in 1863 and it was Harold Curwen and Oliver Simon who in the 1920s developed links with the Royal College of Art and employed many now famous artists and designers such as Claud Lovat Fraser, Barnett Freedman, Edward Bawden, Albert Rutherston, Edward Ardizzone, Paul Nash, Eric Ravilious and Edward McKnight Kauffer. From the 1930s the Press promoted the use of lithography to produce original work on a wider scale. Contemporary Lithographs, established in 1936 by the Press with the help of John Piper, was a pioneering scheme that made the Curwen Press a centre for modern art. It is from the Curwen Archives (now located at Chilford Hall in Cambridgeshire) that this lithograph originates.